Those interested in purchasing an Apple Watch early will be able to pre-order the device just after midnight at 12:01 AM PST (3:01 AM EST) on April 10, according to the Apple website. 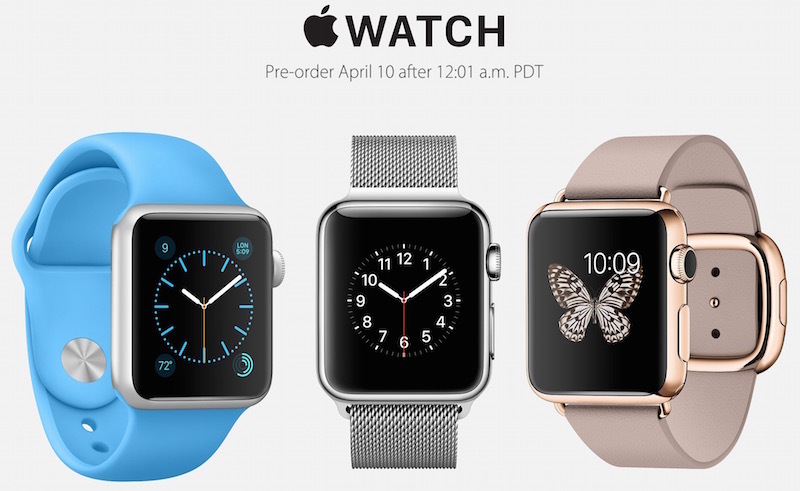 The pre-ordered devices will be shipped to an address or available for pickup at an Apple Store on April 24. Like most new Apple products, it should be expected that models will sell out quickly. This is likely to be particularly true for the more affordable Apple Watch models, so if you’re interested in getting your hands on a $349 Apple Watch Sport or $549 Apple Watch you’ll want to get a cup of coffee or tea and prepare for a late night on Thursday (12 AM PST, 3 AM EST). Users interested in the $10,000 Apple Watch Edition may face shortages as well, though demand for the premium priced WATCH models remains to be seen. For those unsure about which size to get, it may be helpful to use the Apple Store application to get an idea of the actual size difference between the 38MM and 42MM models with the help of an iPhone. Customers who would rather try-on an Apple Watch before ordering will be able to do so starting on April 10 in an Apple Store as well, though they will not be able to purchase in stores until the April 24 release date. Apple Watch requires an iPhone with iOS 8.2 or newer to sync with the device. I think the very expensive (gold 10K+) and plastic/alumminium cheap models are going to sell out very fast, everyone I know who is going to get one is aiming at the $389 42MM plastic model because it’s first gen and an unproven product. But I predict the snob gauche wasters with more money than sense are going to jump all over a 10k trendy item, it’s too bad Apple doesn’t take the revenue from every Edition model and donate it directly to charity instead. Luther you are obviously a very well balanced character, a chip on both shoulders will do that. Grow up just because people have money that they have earned does not allow you to characterise them as “snob gauche wasters” I wonder if you even know what gauche means. Have a good day but I guess you don’t have too many of those do you? I wonder if smartwatches are the next big thing? Makes me laugh, for the non Apple fan it’s over $900 for the cheapest watch as you have to buy an iPhone too. The ultra-expensive Apple fanboy identity bracelet. Maybe after the third or fourth interation. Current Apple watches appear to be marketed strictly to the conspicuously wealthy and the interminable fanboy.